!! Al Gore wins the Nobel Peace Prize !! Former Vice President/climate change warrior Al Gore won the Nobel Peace Prize early this morning, sharing the award with the United Nations’ Intergovernmental Panel on Climate Change. First an Oscar, then an Emmy, now this! He must have a trophy room in his house. Of course President Bush is very excited about all this. He even said publicly that he is “happy” for Gore, but I’m sure he is still blind to the fact of how the Nobel Peace Prize going to climate change advocates highlights his own lukewarm and even detrimental environmental policies. 3 Comments on "Al Gore wins the Nobel Peace Prize"
I find it strange that Professor Lonnie G. Thompson, of Ohio State University, School of Earth Sciences & Byrd Polar Research Center didn’t receive 1/4 Nobel Prize with Mr. Gore. According to the Nobel Website 1/2 the Nobel Peace Prize went to Intergovernmental Panel on Climate Change (IPCC) and it was split with Mr. Al Gore. I think it would be only right that Mr. Gore should split 1/2 his prize with Professor Thompson. 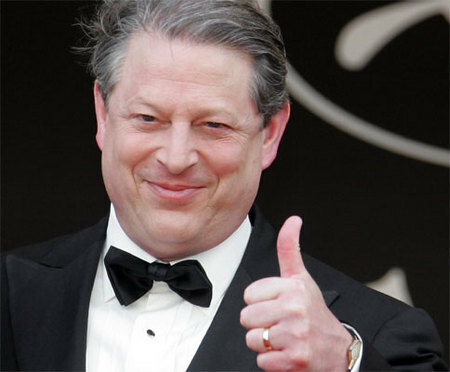 If one didn’t fall asleep in Mr. Gore’s movie, one would know Mr. Gore received a majority of the Scientific Date and Information for his movie from Professor Lonnie G. Thompson, a man who has spent more time above 18,000 feet than any other person on Earth, according to Rolling Stone Magazine. Can someone tell me why the Nobel Foundation didn’t recognize Glaciologist Professor Lonnie G. Thompson and why he didn’t receive 1/4 award, if Mr. Gore presented his Scientific Date / Information in his film? I am really glad Gore brought Global Warming to our attention, but now you have all these “Wannabe Hippies” – people who act like they care because it’s cool to be green, but actually do nothing to prevent Global warming in their own lives.